Arsenal centre-half Shkodran Mustafi could reportedly be in hot water with the FA after his celebration against Cardiff City on Sunday. 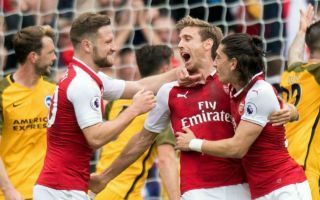 The German international scored as the Gunners eventually claimed a 3-2 win at the weekend, but he has seemingly sparked a possible issue with the FA after his celebration. As seen in his own Twitter post below, as he ran up to teammate Granit Xhaka, he appeared to make a reference to the double-headed eagle on the Albanian flag as he also has family ties to the country despite being born in Germany. The Mirror note that he could now face a fine from the FA if they deem it to be a political message, and if they choose to follow the path set by FIFA, it would appear more than likely that the 26-year-old is going to receive a call from the governing body. As per The Guardian, Xhaka, Xherdan Shaqiri and Stephan Lichtsteiner were all fined by FIFA at the World Cup this summer after Switzerland’s win over Serbia for producing the same celebration. In turn, that would seem like a precedent has been set on displaying what was interpreted as a political message, and it leaves Mustafi at risk of being hit with a similar punishment. While it seemingly won’t be serious enough to be deemed worthy of a suspension, it remains to be seen what stance Unai Emery takes on it as he’ll surely want to avoid his players risk being in trouble. Nevertheless, that will also likely be balanced out by a desire to allow them to express themselves and respect their decisions even if already aware of what the consequences might be.